Why I joined the Extinction Rebellion - Not Dead Yet: Zombies Unite! How does someone who thinks and writes about Utopia end up being a part of a movement that some accuse of being a group of “alarmist” doomers? Why join a movement which argues that to face the reality of climate breakdown and mass extinction we first have to give up hope and grieve? Well, of course because what Extinction Rebellion tries to do, is NOT to make us loose hope and give up, but to loose false hope and through it become able to take action. Action of a scale that corresponds to the scale of our problems. The biggest and most urgent problem right now (but not the only one) being the ecological and the climate crisis. Extinction Rebellion wants us to act and to change the system causing humanity’s self destructive behaviour that is killing us. If this doesn’t sound like an utopian longing to you, what would? While people often forget that utopia is a word play, meaning a ‘good’ but also a ‘no’ place and therefore should be used as a critical thinking tool NOT as a blueprint to build societies on, the ‘dys’ of dystopia just means ‘bad’ place. Both are related and in their imaginative form, dystopia can be used to unveil and highlight what is wrong with our present societies, just as well as utopia. The problem is that dystopias, as their name suggests, are perfectly able to become reality. And this can start to happen exactly because a group of people might mistake their conception of utopia as a blueprint to build a society on. One imagines that if something like that starts happening, other people would notice and start rebelling before it’s too late. But it turns out that humans still need to be able to imagine other utopias to be able to rebel. When, as in our case, the utopia turned dystopia has been successfully sold as being the only and best of all possibilities, the end of history, “no alternative” left … then people can start to become so demoralised that they are unable to imagine anything better. Instead of rebelling, they then just try to suppress their fears and stubbornly cling to the “small dreams” left, which they believe are still achievable within the system. It doesn’t matter that the whole world around them might already be burning. The shocking part might not be how hard it still is to imagine any alternative to capitalism, but how easy it is to imagine and come up with examples for the second bit. That big business is not only wrecking the world, but might already be trying to turn a profit on the end of the world, seems … obvious. Not much imagination necessary, many of us might even have a hard time feeling much outrage about it. All one can muster is maybe a bit of cynicism and then an effort to change the subject. Is it really hope we could loose, if we would do what Extinction Rebellion asks as too, and started to grieve? I think, when the quickest way to render life unbearable is to think about it, what we could loose isn’t hope but what seems the only way to go on: denial. I spent Halloween (2018), the day Extinction Rebellion appeared for the first time, on Twitter doing a little art action, which basically was about trying to recruit fellow zombies for an uprising. I have been calling myself a zombie for a while now to express my desperation about being part of a humanity that acts in this self destructive denial. I have my own theories why we humans keep “devouring” each other and our home planet, and they mostly stem from thinking about Trauma and mental health and I will write more about it soon. The art action was simple and, as I expected, a pretty lonely undertaking. I had created a couple slogans on posters, that I shared during that day. I knew I would probably reach close to no one, which for me never was a reason to not keep on trying. I saw a tweet by Kate Raworth ( Doughnut Economics) about Extinction Rebellion’s first action and what I read felt a bit like electrical current entering my veins.Yes, my undead heart started beating! 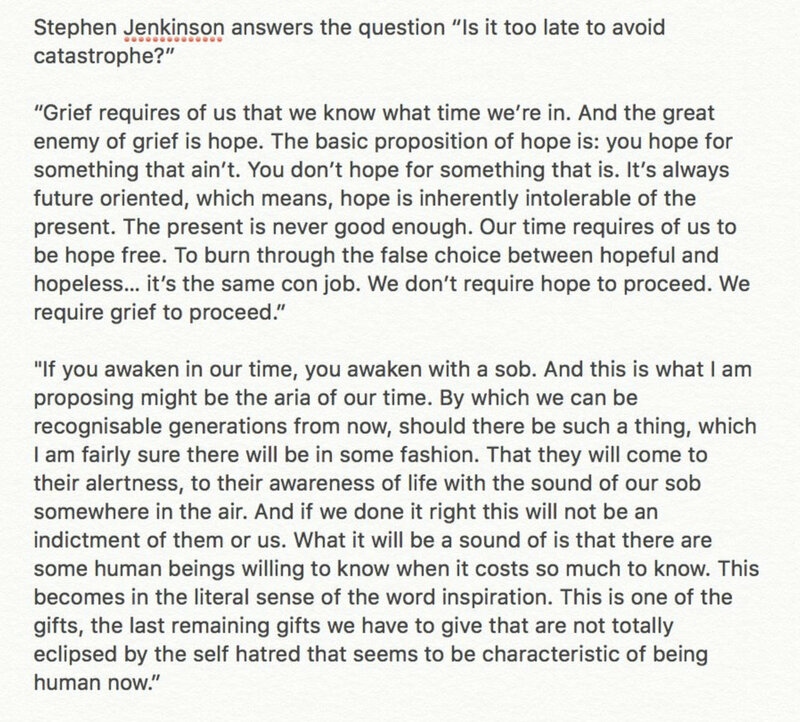 I didn’t and still don’t agree with Jenkins that our times require us to be “hope free,” but I felt like I knew what he meant. I also felt that the way he describes it leaves a lot of space for misunderstandings, especially if you ever felt afraid of falling into depression. And I think today most of us are. Instead I believe Greta Thunberg got it right. This young and clear headed climate striker, who started the #FridaysForFuture movement but also gave a speech at the declaration of rebellion that day. because hope needs to be earned. People who suffer from depression often not only can’t find any reason to get out of bed, because life seems meaningless and the world without sense, they also become scared that any positive emotion, any hope, is a dangerous illusion. Feeling like that must be terrifying and extremely painful. Who could blame anyone for not wanting to be ‘hope free’? Most of us feel despair and are afraid of loosing hope all together, slipping into darkness and giving up. A lot of us can’t bear watching or reading the daily news of this world that seems just cruel and senseless. But feeling and knowing that the world is all wrong and believing your life has no meaning are two different things. I always felt and knew the first but was lucky to never have felt the second. There are many forms of depression, and even though I never felt that second bit I was recently told by a therapist that I might suffer from double depression. That kind of surprised me, because I always related to people with depression, but I also always wanted to live. What makes me different and the reason I usually have no trouble getting out of bed might be that what I have started before I could consciously think. As a baby, who was born sick and in pain and who had to spent lots of time alone in hospital. Being depressed seems to me just being me and I only notice, when I fall into what I call crying times. But even during those times, I don’t feel like my life is meaningless or that I want it to stop. It’s just that I can’t stop crying and that can go on for a pretty long while, which is tremendously exhausting. But still, for me there’s a little joy and meaning even in those times. I think one reason I have this gift might be that I had to learn to deal with pain on my own so early on. The last time these crying times happened to me was right with the Trump election and the #metoo movement reminding me that I also suffer from PTSD. That time was the longest so far. Usually these crying times can last weeks or months but this time I did seek help for the first time, because it lasted for much more than a year. Waking-up crying almost every day, or being overwhelmed by tears all the time without warning or being able to stop it, is exhausting. Especially if you (and I am lucky I can since I do it from at home) get up and keep working. Even if you, like me never wanted to kill yourself and love life so dearly, if it lasts that long one might run into problems out of pure exhaustion. And I did, I had an accident. I am telling you all this, not only because depression and mental health problems are still a tabu and shouldn’t be, but because I want you to understand what makes my perspective a little different and maybe helpful to explain why I think Greta and Extinction Rebellion are right about that real hope lies in confronting the truth and acting on it. Realising that she could do something about climate change was part of what helped her recover, (Greta) explains. Just as Greta, I always had trouble with being social, though I was never the invisible girl. I was rebellious from the start, I felt like I have nothing to lose but myself and my love of life, which made me courageous, maybe sometimes a bit too much. And I always felt lonely but never alone, though my friends I found in paper people (or what others call books), art and music. Sad music for example always had the power to make me feel connected, happy, grateful that I am alive. I never understood why people want to hear something happy when they are feeling sad. I love bitter sweetness and humour. However, I think what made my depression maybe less impairing for me and a bit different, was that very early in my life there were two people who helped me greatly. The first was a speech therapist who, when I was 3 to 4 years old, helped me find my voice through art. The second was my 5th grade teacher, Frau Schulz, who seemed to be the only one, who valued my tough questions. She encouraged me, to even if I don’t get answers to keep searching in books and my own mind. And to express these adventures in my head I had while searching. They both taught me to act, to open up, to do something when I couldn’t find “connection”. And it wasn’t about needing something from others, but me. Myself being able to act, being able to create a door, even if nobody in particular was going to enter it yet. And they were right, just doing that always made me feel better. Being lucky meeting these wonderful human beings didn’t save me from falling in those deep and dark pits though. Those pits where I was sometimes trapped crying (often after being really, really angry) for weeks and wondering how other people could just go on like it is nothing that the world is all wrong. But I had this gift they gave me always with me. This gift of having and being able to create my own meaning. A meaning that was not tied to the judgement of society or what society deemed as being successful. They gave me the tools to face cruel realities: to try to imagine change and connection and act on it, however I could. I sometimes get asked by people close to me, why I always spend my times thinking about problems and how I can take doing this. Of course always looking at problems and how the world works all wrong is “depressing”. But what they don’t get is that I get inspired all the time by other people, who courageously choose to act. I search for these people and their ideas and I learn so much, not only about what is wrong with humanity but what is beautiful. It’s where I find meaning. There is one more gift those early teachers gave me, maybe the most important one. They made me understand that even if I seem to not fit, it’s not me that needs fixing. Greta calls her Asperger a gift, the gift of seeing black and white and needing to act on what seems right. For me, I think, my gift was simply knowing that I survived, that I love myself and life somehow, the small bits even if the whole thing just never seems right. And no, that doesn’t mean I am happy most of the time, or don’t see my shortcomings. If I know one thing well, it is frustration. But that never kept me from trying or made me give up hope. Being an Utopian for me is not naiveté or falling prey to false hopes, it’s the opposite, it is an act of rebellion. It’s earning my hope by trying to imagine different ways how things could be better and trying to make change possible. For me that is trying to tell different stories, to help others see what I see and get over their fears. Because despite all those crying times, I do know how it feels to be alive. And it pains me to see so many people I love trying to fill holes in their souls with stuff that isn’t helping. Utopia is not a goal, no place to reach, it’s dynamic, it’s always changing. Just like with learning, mistakes and frustration are vital parts of it and if you believe there is a final stage to reach, you haven’t yet understood what it’s all about. Utopia is more like a direction and I don’t think it’s a coincidence that direction sounds a bit like direct action. It’s a way to try to make things better, without pretending to have solutions. It’s trying to live as if change is possible. So, that’s why I joined the Extinction Rebellion and I hope you will too. If you still feel reluctant because the word rebellion fills you with fear and you think getting arrested for our future seems so much more radical than you are. Rest assured not everyone has to be up for being arrested to be part of this (though facing reality you might start to want to). All are welcome. All you have to do is to agree to follow Extinction Rebellion’s 10 principles and values (which for me were another reason I immediately wanted to join) and wanting to act on them. Radical just refers to your commitment to wanting to learn and try to live together in ways that cause less harm. We need all kinds of people, with all kinds of talents and each and every one of us has something very valuable to give. And please don’t feel sacred that you might not be “perfect” enough in your daily actions for joining a movement against the climate crisis, because first of all, Extinction Rebellion is not about the climate, and second of all, Extinction Rebellion is explicitly NOT out to blame anyone. Not a movement that offers solutions but an invitation to create change together. Western consumer culture is creating a psycho-spiritual crisis that leaves us disoriented and bereft of purpose.